The No.40 guernsey will grace the football field once again next year, with Jesse Glass-McCasker taking on his mentor's number. Rookie Jesse Glass-McCasker played 14 VFL games in his debut year at Carlton. Carlton's first-year players recently went head-to-head in the kitchen to see who would be crowned the Blues' 'Master Chef'. Though he’s yet to experience the rigours of senior footy, Glass-McCasker’s showings at VFL level would suggest a Carlton senior call-up is well and truly on the cards. Originally secured with the club’s first selection in the 2016 rookie draft, could this be the break-out year for big Jesse? 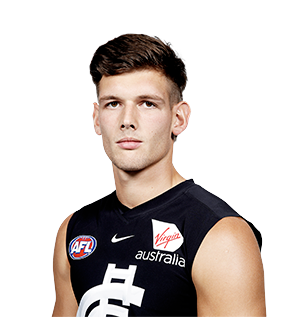 Draft history: 2016 Rookie Draft selection (Carlton) No.1.